The postback concept is from ASP.NET Webforms and there's no real parallel in MVC, which is a good thing because the postback model encouraged ignorance of a site working with HTTP in a stateless manner. 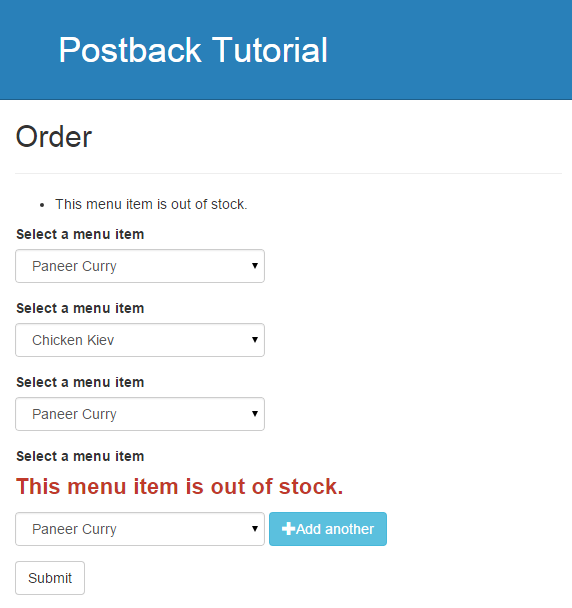 However it is still possible to create a postback style model in MVC. And a class called Menu which provides a list of different meals and the ability to order them. Currently this view has one submit button which posts the entire form. Both buttons now have a name attribute (submit) and different value attributes, "add" and "submit" respectively. We can now detect which of the two buttons have been clicked in the controller action and do different things for either button. Currently our controller submits the form for both buttons. The controller action takes a string parameter with the same name as the submit buttons, the value of this will either be "add" or "submit", the values we set for the buttons in our HTML. The action first adds the currently selected item to the list of previously selected items if present. After checking that the ModelState is valid (i.e. that there is a currently selected item) it chooses one of two methods to call depending on the button pressed. There is a method for the add post and the submit post. Add: Sets the currently selected item to null and returns the view. 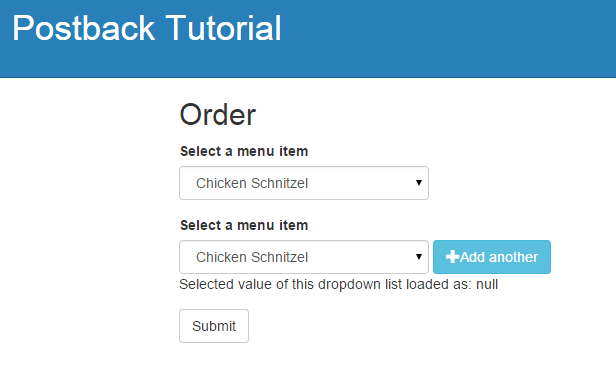 Submit: Orders the items and moves to the summary screen. It's important to note that this approach goes against the way the MVC framework is designed, by design MVC treats the return of a view (rather than a redirect) from an HTTP POST as being due to Validation errors. In this step there have been some changes to the view to provide partial views showing the current selection input and previously selected items. Currently we have a problem, when we click "Add another" and the page performs a postback, the current input still loads with the previous value selected. Even though we set the selected value to null in the AddPostback method and it loads in the view as null it's not resetting in the view. Somehow MVC has cached the value for this dropdown. We will address this problem in the next post.